Buried: St Helens Bishopsgate London. 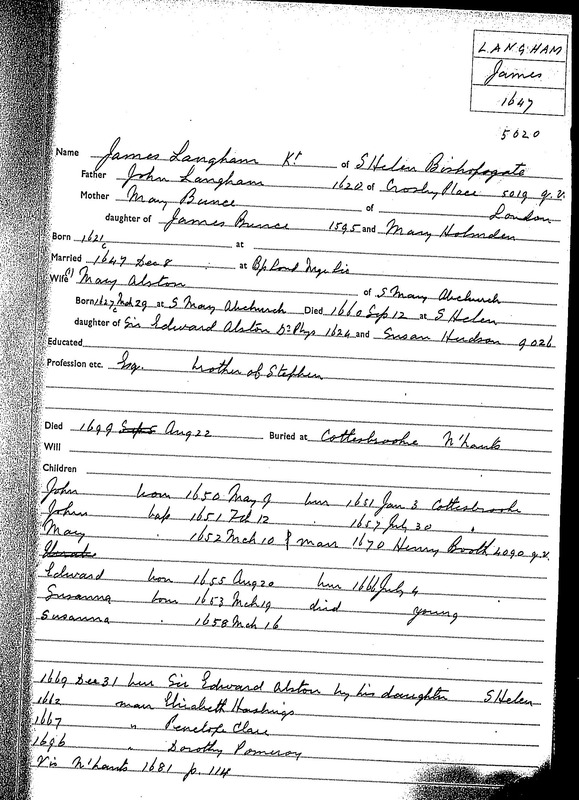 James was M.P. for Northampton and Northamptonshire, and a Fellow of the Royal Society at a cost in those days of 10/- for admission and 1/- per week thereafter. He was a classicist and Bishop Burnet described him as "famed only for his readiness of speaking latin which he had attained to a degree beyound any man of his age: but he was become a pedant with it and his style to poetical and full of epithets and figures". Sir James was the son of Alderman Sir John Langham, Sheriff of London, who was created a baronet at the Restoration as a recompense for his sufferings in the royal cause, having been twice committed to the Tower with the Lord Mayor and others for refusing to publish an Act for the Abolition of Royalty. Marriage Licences Issued by Bishop pf London, Vol 3. Dec 8 1647, James Langham, gent. of St. Helen's, Bishopsgate, Bach. 26, and Mary Alston of St. Mary's Hill, London, spinster, 20, daughter of Edward Alston, same, Dr. of Physic, who consents at Great or Little Bartholomew or St. Peter the Poor. 1. Boyds Inhabitants of London. James next married Lady Elizabeth HASTINGS  [MRIN: 1667] in 1662. James next married Lady Penelope HOLLES  [MRIN: 1668] in 1667. 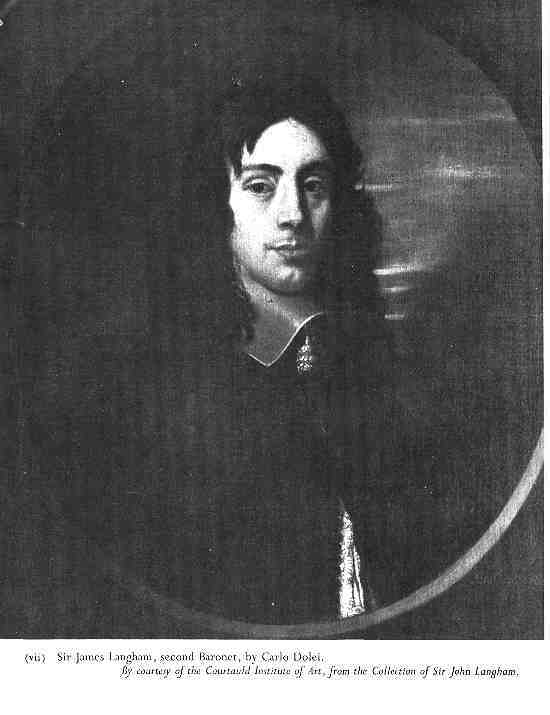 James next married Dorothy POMEROY  [MRIN: 1669] in 1696.